Savage's hard-hitting new Model 110 Hog Hunter is as tough and versatile as the animals it's built to bring down. Shipments of these firearms are currently being delivered to dealers. Length-of-pull can be customized to fit any shooter for comfort and consistency, and the user-adjustable AccuTrigger provides a light pull. 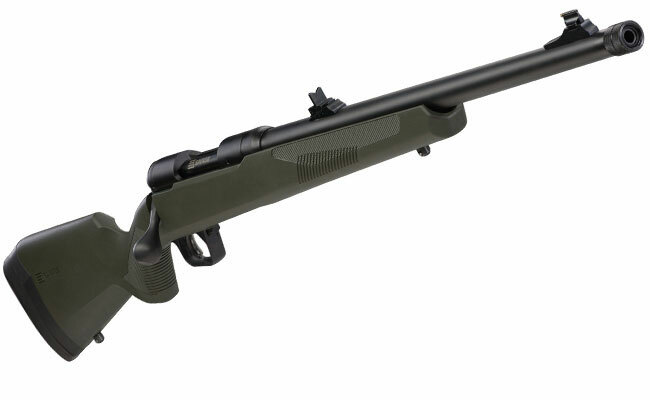 The rifle is built on Savage's 110 platform, but with a modern design and improved ergonomics. A rugged synthetic stock holds the 20-inch, medium contour, carbon steel barrel, which features iron sights and is threaded for a suppressor. Its oversize bolt handle allows for fast followup shots, and the detachable box magazine is designed to never catch on brush in the tangled thickets where hogs love to hide.